I plan to make a full 1.0 release in July. File bugs, rough edges, things you want me to know about, and interesting behavior at https://github.com/ljwolf/cenpy! I'll also maintain a roadmap here. datamade/census - "a python wrapper for the US Census API"
jtleider/censusdata - "download data from Census API"
And, I've also heard/seen folks use requests raw on the Census API to extract the data they want. 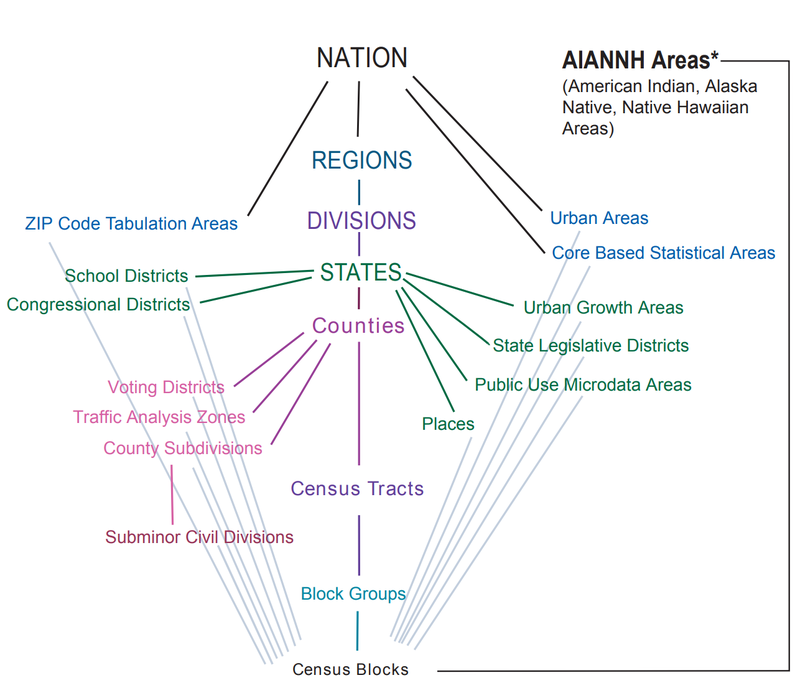 The main census API does not allow a user to leave middle levels of the hierarchy vague: For you to get a collection of census tracts in a state, you need to query for all the counties in that state, then express your query about tracts in terms of a query about all the tracts in those counties. Even tidycensus in R requires this in many common cases. what are the counties in Arizona? what are the tracts in all of these counties? what are the blocks in all of these tracts in all of these counties? So, if we focus on the geo-in-geo style queries using the hierarchy above, we're in a tough spot if we want to also make the API easy for humans to use. what are the blocks *within* Arizona? There is a geographic information system that cenpy had access to, called the Tiger Web Mapping Service. These are ESRI Mapservices that allow for a fairly complex set of queries to extract information. But, in general, neither census nor censusdata used the TIGER web map service API. Cenpy's cenpy.tiger was a fully-featured wrapper around the ESRI Mapservice, but was mainly not used by the package itself to solve this tricky problem of building many queries to solve the geo-in-geo problem. Instead, cenpy1.0.0 uses the TIGER Web mapping service to intelligently get all the required geographies, and then queries for those geographies in a very parsimonious way. This means that, instead of tying our user interface to the census's datastructures, we can have some much more natural place-based query styles. Let's grab all the tracts in Los Angeles. And, let's get the Race table, P004. How this works from a software perspective is a significant imporvement on how the other packages, like cenpy itself, work. Using the Web Mapping Service, find all the tracts that fall within our target. Using the data API, query for all the data about those tracts that are requested. Since the Web Mapping Service provides us all the information needed to build a complete geo-in-geo query, we don't need to use repeated queries. Further, since we are using spatial querying to do the heavy lifting, there's no need for the user to specify a detailed geo-in-geo hierarchy: using the Census GIS, we can build the hierarchy for free.